Transactions on Blockchain are quicker, making it a more cost-effective mechanism for reporting and decision-making. Many industry experts have labeled Blockchain as the next techno-financial revolution. Don & Alex Tapscott, authors of Blockchain Revolution (2016), describe Blockchain as "an incorruptible digital ledger of economic transactions that can be programmed to record not just financial transactions but virtually everything of value." Transactions on Blockchain are quicker, making it a more cost-effective mechanism for reporting and decision-making. Furthermore, Blockchain enables high-availability platforms for smooth and seamless financial transactions. Most Blockchains, with Bitcoin being the prime example, have a digital currency associated with them. In late 2013, Vitalik Buterin, the then 18-year-old wonder child, proposed the idea of Ethereum. He holds that Bitcoin along with "competitor currencies" (knock-off currencies) are just like real calculators used for various purposes. It is unnecessary to create different currencies for every scenario, as it might lead to inconsistencies in the value being exchanged or transacted. This resulted in a need for establishing a platform where people could compile smart contracts for various application scenarios using Uniform Commercial Code (UCC). With passing time, Ethereum came out with several versions and entered a stable and rapid development phase. People gradually started recognizing the power of Blockchain, and the antagonists of Bitcoin in early stages became the pioneers in promoting Blockchain as a technology. In 2014, Barclays, HSBC, along with other leading banking and financial institutions initiated the R3 Alliance. In China, the establishment of China Ledger and Bank Ledger followed in succession, with "Wanxiang Blockchain Labs" aimed at researching and promoting Blockchain technology. 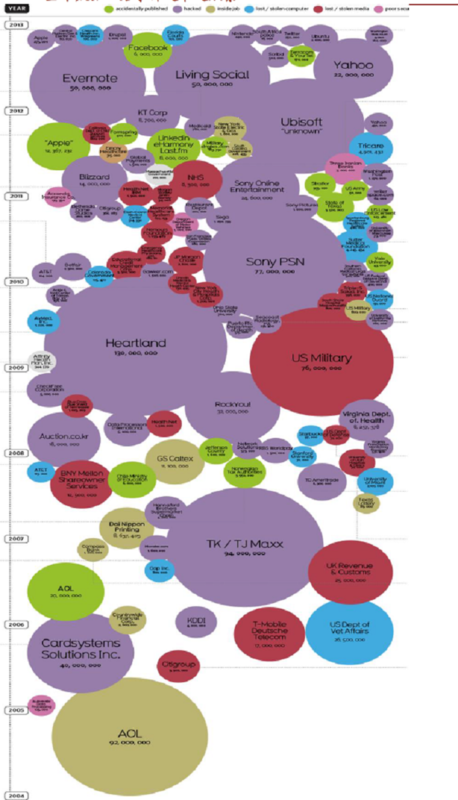 IBM, Microsoft, and other technology giants also made huge investments in this sector. It seemed that the techno-financial world had pioneered into a new age, which witnessed mushrooming of technical talents, just like star-studded 1980s. Everyone compared the impact of Blockchain to that of the Internet 30 years ago. At the same time, the contribution from the government should not be underestimated. The Federal Reserve System (FED) of USA pooled together 90 central banks around the world to hold a Blockchain meeting at its headquarters. While Britain was on the verge of exiting the EU, it was considering replacing the British Pound with Bitcoin. 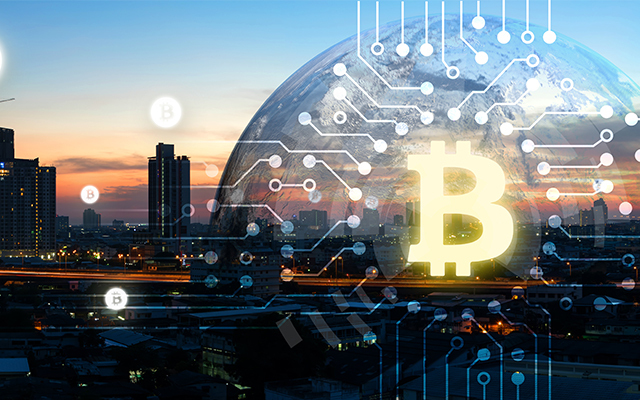 Around the same year, Canada's central bank made an announcement regarding the development of Blockchain-based legal tender, while Sweden and other countries started trailing the usage of Blockchain to register land property rights. This was followed by China's central bank president Zhou Xiaochuan announcing that China would issue a separate "digital currency" for itself. Though initially intended for the financial sector, developers and other stakeholders are increasingly exploring and leveraging this technology for other suitable scenarios. As long as the legal support is in place, Blockchain technology will witness faster development. Despite the Artificial Intelligence (AI) community having its fair share of Blockchain critics, Blockchain has been able to make inroads into AI. Before we proceed, it is crucial to understand Blockchain's credibility mechanism. In Blockchain, device users can register achieve user access for different levels through the smart contract. To achieve this, Blockchain ensures that the device can achieve hierarchical access through user registration. This is done to provide personalized features for users at various levels. This not only prevents devices from being abused but also protects users from any cyber damage. Blockchain also facilitates the shared ownership and usage of devices by allowing users to jointly set the state of devices and make decisions based on the smart contracts. Besides, such a registration mechanism will persist throughout the lifecycle of the device. This mechanism allows various users, software, and hardware to assist the supervisor in confirming the accurate time points of device faults. The Internet of Things is a technological phenomenon that has added infinite possibilities to what a meager common object has the ability to do. Blockchain experts believe that it can act as a catalyst for IoT, ensuring that it is better managed and well implemented. IoT aims to connect literally everything possible to each other via the internet. Such a massive network with its infinitely many elements and connections leads to the challenge of centralization and management. Let us look at some stats and figures to give you an estimate how large this network can potentially be. Gartner Inc., a research firm from the US, forecasted in a report that the number of the Internet of Things devices around the world would reach 4.9 billion in 2015, generating revenue of 69.5 billion US dollars. In 2020, this number of the Internet of Things devices will be around 25 billion, and the marginal benefit related to the Internet of Things may reach 263 billion US dollars. With such massive scale and numbers, companies need to aim at solving the data management needs for the Internet of Things. Fortunately for organizations, Blockchain can act as their savior. Blockchain opens the door for IoT's control to be decentralized. This is possible due to the decentralized feature of Blockchain that provides self-governance methods. It helps devices in the Internet of Things to understand each other, by aiding them in comprehending the relationship they have with each other. It also helps in achieving decentralized control over the distributed Internet of Things through addressing and permission control. In addition, Blockchain enables the creation of secure mesh networks by allowing various nodes to be filled by specific devices, preventing outside interference and manipulation. It facilitates IoT devices to reliably interconnect while avoiding cybersecurity threats such as device cloning. 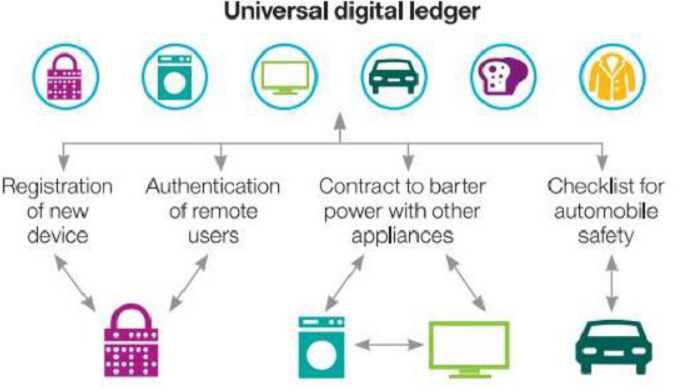 The image below illustrates the application of Blockchain in IoT. With big data becoming a substantial part of how the world functions, more and more personal and sensitive information is available on the network. This centralized database is exposed to the public and prone to hacker attacks. Database leakage incidents are being reported more than ever before. Researchers surmised that the Blockchain technology, due to its advanced decentralized features, is likely to become the preferred solution for improving big data security in the future. Its advanced decentralized feature ensures that no one can control or edit the data. This ensures that a leakage of the entire database is not possible through the leakage of a single private key. Since most data leakages come from source leakages, decentralizing the ownership of data could be an ideal solution to the problem. Despite its potential benefits, Blockchain has not been widely applied yet in the field of big data security. However, successful application of Blockchain in other fields will definitely open up the floodgates to its application in big data. Reduced Operation Costs: Business models of financial organizations work in the background, and usually have long, internally linked procedures. Blockchain provides a possibility to simplify and automate these manual financial service procedures that reduce overall operational costs significantly. In fact, a report released by McKinsey & Company endorsed this finding, stating that Blockchain finance will achieve an electronic, Blockchain-based systematic trading of bonds, reducing frontend and backend workforce costs. Improved Payment Efficiency: Blockchain is an attractive proposition for several banks, primarily because it is a reliable, detail-oriented and irreversible record system with a promising payment application. A short-term impact is already evident with the global cross-border transfer market reaching $583 billion last year. A major contributor of this accolade was "Ripple", a payment settlement system built on the distributed ledger. Inspired by Ripple, Earthport also launched its distributed ledger service in August 2015. It integrates the potential of Ripple and cross-border payment service of Earthport while using local Auto Clearing House (ACH) to handle global settlements. At the same time, various financial organizations are carefully considering using Blockchain technology behind Bitcoin as an alternative for their clearance and settlement systems. Helps Meet Supervision and Client Requirements for Data Records: Deloitte believes that Blockchain technology solves persistent difficulties of the auditing industry. It meets public demands along with requirements of the supervision department. It also ensures integrity, permanency, and incorrigibility of all financial data. Blockchain can contribute significantly to the business-to-business (B2B) payments landscape by addressing issues regarding large payment volumes and cross-border friction. It can also be of considerable importance in foreign currency exchange. In the long term, Blockchain may be a significant contributor in replacing the existing centralized structure of the financial services industry. "On Friday, June 17, the WeChat group suddenly went aflutter towards the end of the day. I put aside my work and carefully looked at what agitated the group. It turns out that Vitalik Buterin, founder of Ethereum, disclosed in the Slock.it community that DAO has vulnerabilities and has undergone an attack. Plenty of ethers are at risk of being stolen. I went to the technical community to learn more about the attack. It was a result of the code vulnerability of the smart contract redeemed from DAO, which allowed hackers to steal others' ethers. As a result, the DAO currency plunged and affected Ether, which suffered a slump of nearly 20% within an hour." Currency devaluation, though, was just one aspect of the problem. Concerned members and technicians in the community had to solve it as soon as possible by any means necessary. Although traditional centralized apps could quickly fix the vulnerability by submitting a patch, mending DAO was a different and challenging issue altogether. The challenge before the technicians was that Blockchain and its smart contract could not be intervened or stopped once it is started. Therefore DAO, as a decentralized app (dapp), could only watch the vulnerability being opened until the gas exhausted and the application would ultimately stop. It is only then that the code can be modified. Once modification of the code is complete, it would be possible to redeploy and restart the application for the fix to take effect successfully. With Ethereum's advanced underlying Blockchain technology, it is perceived that it will become the app store of Blockchain and has the potential to keep creating truly decentralized organizations like DAO. The fact that it requires only three lines of code to launch a digital currency like Bitcoin on the Ethereum network proves the scope of Ethereum's effect. The Blockchain technology is a revolutionary innovation set to change how the world functions. Blockchain applies to virtually every field; there seems to be no corner that it fails to touch or impact. Although it might be too early to call, Blockchain has the potential to transform the way various industries work. It has surely pushed existing techno-financial systems to new heights with its secure and transparent environment for transactions. 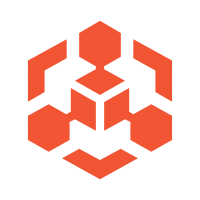 BaaS provides an enterprise-level platform service based on leading blockchain technologies, which helps you build a trusted cloud infrastructure.